While some of them increased their profits, other banks did in fact come back from losses. Impairments fell, margins increased and ratios are growing stronger. The Portuguese banking continues a recovery trajectory. BPI, Santander Totta, BCP and Caixa Geral de Depósitos were able to multiply their profits in the first three months of the year, in comparison to the same period of last year. The largest financial institutions in Portugal — and excluding Novo Banco, which has not presented accounts yet — collected the fruits from their efforts to return to profitability, benefiting from a plunge in impairments, but also from the margin increase. 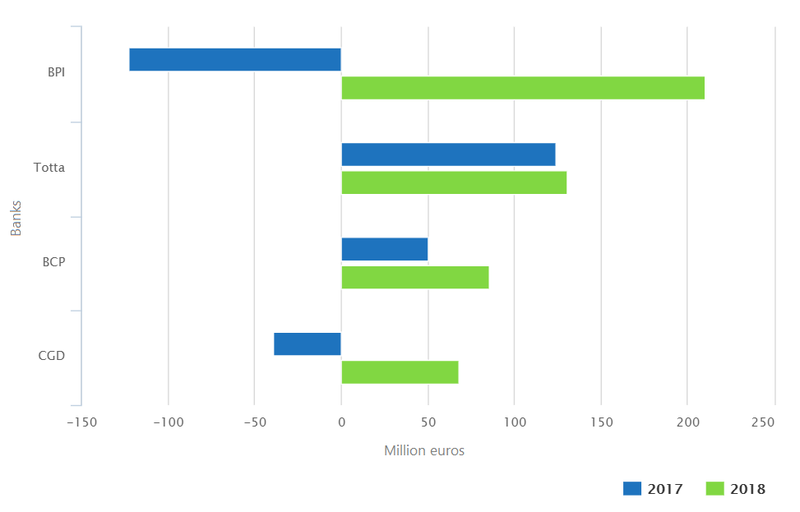 From the 494 million euros’ total, BPI is responsible for the largest “slice”. By itself, BPI profited 210 million euros. Second place on the list is Santander Totta, which had a positive result of 130.5 million euros. Next comes BCP, which earned 85.6 million euros. CGD had “the smallest” profit, but when compared to the same period of 2017, it is one of the best recoveries: it left behind 39 million euros losses, thanks to the positive contribution of the activities in Portugal, which hadn’t happen in several years. The problem with nonperforming loans (NPL) keeps worrying banks. However, thanks to all those efforts to reduce that “burden”, toxic assets weight in less in the profitability of financial institutions. The total amount of impairments registered in the accounts of the first quarter of 2018 went from 243 million to 91.7 million euros, according to ECO, based on banks’ accounts. As for BPI and Santander Totta, there was even an inversion in impairments. The same is to say that they were able to recover more defaulted loans than they foresaw. In BCP, although the provisions amount is still high, NPL also fell to 106 million from 148 million euros. As for CGD, it registered 95 million in impairments, taking on a 13 million euros’ loss. In this first test of the year to banks’ results, capital ratios keep getting stronger. These ratios are analysed by banking authorities to analyse the financial strength of an institution in a scenario of economic adversity. The lower the ratio, the more unprotected is the bank. Santander Totta remains the “best student” in this capital position reinforcement. It has a CET1 capital ratio, fully implemented, of 15.1%. But it was CGD that presented a more significant improvement: it went from 12% to 13.6%. This is explained by the banks’ efforts to “clear” the banks’ balance. Although less steep, both BCP and BPI had a recovery: 11.8% and 11.4%, respectively.